Ashley (Macabre Queen) has been modeling for 4yrs, specializing in horror cosplay and pinup. Her favorite cosplay is Leatherface. Her pinup influences are Yvonne De Carlo, Peg Bundy, and Betty Boop. She has loved horror since she was a kid and has a passion to create unique horror art sometimes mixing in pinup fashion. 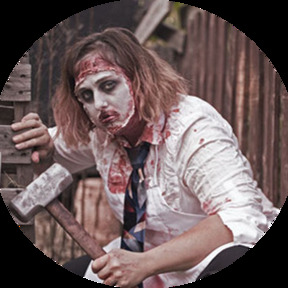 She has recently started running her own projects under the business name Macabre Queen studio. Working along side talented photographers and models she is looking to bring her visions to life.